Forty-eight Zambian MPs from the opposition UPND have been suspended for 30 days for boycotting President Edgar Lungu’s state of the nation address. They refused to attend in March as they argued Mr Lungu was not the legitimate winner of last year’s election. Parliament speaker Patrick Matibini said the MPs’ boycott was “gross misconduct”, Lusaka Times reports. The suspension comes as UPND leader Hakainde Hichilema is in detention facing treason charges. Zambia’s government has faced criticism from the country’s Conference of Catholic Bishops over its handling of the case of the opposition leader. It warned that Zambia was slipping towards a “dictatorship”. The suspended 48 MPs represents nearly the entire parliamentary party of 58. 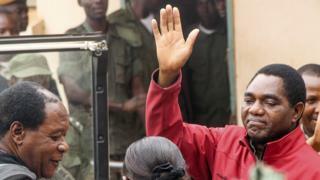 Zambia has been locked in a political crisis since Mr Hichilema was arrested in April following an incident in which a convoy he was travelling in allegedly refused to give way to the presidential motorcade. Mr Hichillema, who lost to Mr Lungu in last year’s close election, is accused of endangering the president’s life. His lawyers argue that the charges are politically motivated.